I’ve long been interested in the megafauna extinctions of Pleistocene North America. A number of books endorse Paul Martin’s “Pleistocene Overkill Hypothesis,” which asserts that the early humans on the continent were “super predators” who launched a blitzkrieg of overhunting. Hunting began in northwest Canada, and spread south and east like a wild fire. Within 2,000 years, at least 33 genera (50 species) of large mammals went extinct — many more than in the preceding three million years. At first contact, large animals who had never before seen odd-looking humans, did not sense danger. In other locations, when humans first arrived, extinctions followed — for example, Australia, New Zealand, Madagascar, and Caribbean islands. Hunting, and hunting alone, was the cause, said Martin. His ideas really pissed off Native Americans, like Vine Deloria, because overkill implied that Indians were as foolish as Euro Americans. Deloria blasted the hypothesis, pointing to the fantastic number of bones found in northern Siberia — mammoths, mastodons, rhinos, horses, bison. Chinese have been hauling away mammoth tusks since medieval times, and this ivory is still being mined today; a high-quality tusk can fetch over $40,000. The white keys on grandma’s piano might be mammoth ivory. These bones were not the result of a blitzkrieg. Mastodons had been living in Siberia for 400,000 years, and woolly mammoths for 250,000 years. The frigid climate helped to preserve their remains. 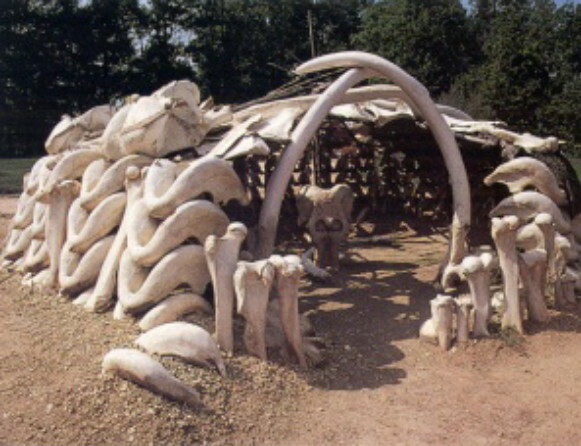 In central Russia, more than 70 mammoth bone huts have been found. One hut had 385 bones, and weighed 20 tons. 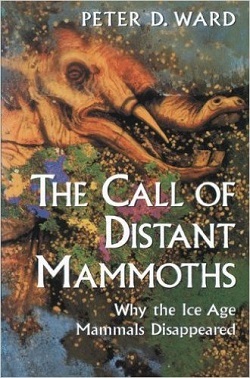 I just read The Call of Distant Mammoths by paleontologist Peter Ward, and learned a lot about extinction and evolution. I’ve often wondered how hairy lads, on foot, with wooden spears, were able to exterminate every horse in all of North America within 2,000 years. Bison were also residents of the open plains, able to sprint up to 35 miles per hour, and they did not go extinct — and horses could run even faster. Ward introduces us to the climate change hypothesis. During the two million year Ice Age (the Pleistocene), there were at least 18 glaciation cycles. Until the last cycle, the megafauna had mostly survived. The last one began 18,000 years ago, and it was the most intense of all. It ended 12,000 years ago. The ice pack melted, forest advanced, and habitats rapidly changed. The mammoth tundra fragmented and shrank, which split the herbivore population into isolated groups. Ward also studied the extinction of dinosaurs. They roamed the Earth for 160 million years, and then disappeared. Ward was an early advocate of the notion that the dinosaur mass extinction was sudden, caused by an asteroid strike near Chicxulub, Mexico. Some say it resulted in a decade of near-freezing temperatures on a planet that was largely tropical. Throughout the dinosaur era, small mammals also existed — insect eating night creatures. The extinction of dinosaurs eliminated large animals, and made the age of mammals possible. If not for the asteroid, humans and elephants would have never evolved. Mammoth country once ranged from France to Siberia to New York. Our primate ancestors evolved in the trees. Their tropical homeland was eventually chilled by an era of glaciation. It thinned the rainforest, and expanded savannahs, which encouraged the evolution of large mammals, including our hominid ancestors. Thus, you and I are the children of climate change and asteroids. Evolution is a process that creates and deletes species. New species can only emerge when a group becomes isolated, evolves unique traits, and eventually becomes unable to interbreed with their old kin. Homo sapiens come in many sizes, shapes, and colors, but all belong to the same species, because we can all interbreed. Ward expects white skinned people to disappear in a few thousand years, because of their increasing vulnerability to skin cancer. Our cultural myths tell us that humans are continuously getting smarter. Ward believes that the brains of modern humans are essentially the same as the first Homo sapiens in Africa, 125,000 to 200,000 years ago (but we’ve learned lots of stuff since then). Once a new species emerges, it changes little thereafter. Humans are the last species of the hominids, and this has risks. A gene pool has better odds for long-term survival when it diversifies into multiple species, as the ants have. Another way for critters to avoid extinction is to become generalists, like humans, rats, and cockroaches, who have adapted to many different ecosystems around the world. Today, humans live everywhere. There is no place a group could remain isolated for millennia. So, there is little chance for a new hominid species to emerge. Evolution is random, like tossing dice. The process is influenced by ongoing environmental change, natural selection, and genetic drift (chance genetic changes). Evolution has no foresight; it can’t anticipate coming changes. It’s not always progressive. Greenland ice core data tells us that there have been times when global temperature changed up to 18°F in a few decades. Many gene pools that work well in one set of conditions will fail to adapt to sudden shifts. The golden rule of evolution is adapt or die. Ward doesn’t discuss cultural evolution, which is a million times faster than genetic evolution, and has catapulted humankind onto extremely thin ice, by overloading our tropical primate brains with way too many half-smart ideas. We are, by far, the world champion resource parasites. We are hurling countless species into the abyss in our insane impossible quest for perpetual economic growth. In an extremely quirky twist, Ward celebrates human supremacy at causing mass extinction. “We are the comet now. And not only have we won the game of evolution; we control the rules of the game,” he wrote. “And to this winner, in my view, goes an even greater prize: species immortality. It is my opinion that no matter where on the board we humans land and no matter what card we draw, we cannot be knocked into extinction.” Who could disagree? The book was written 20 years ago, when resource limits and climate change were still dumb ideas among the lunatic fringe — rational people. Ward is employed in academia, which remains a militant hotbed of radicalized human supremacists. OK, back to the megafauna. Doubts are growing about the overkill hypothesis. Martin claimed a sudden 2,000-year rampage wiped out the megafauna, but this was based on data generated by obsolete dating technology. Improved dating does not confirm sudden extinction. Martin claimed the extinctions fanned out in a wave, beginning in Alberta — so kill sites far from there should be more recent. They aren’t. We have only discovered a dozen sites where human artifacts are found with mammoth remains. Ward suspects that the mammoths were not the victims of a blitzkrieg. Unlike bunnies, mammoths were slow to mature, and had low reproduction rates. If hunters had regularly taken just two percent of the animals each year, the extinction process would have taken 400 years — too slow for each generation of hunters to notice. Hunting alone could have wiped them out. Ward thinks that if there had been no hunting, mammoths would probably have survived the warming climate. In the 1990s, editors adamantly insisted that manuscripts like Ward’s include brilliant solutions and happy endings, because bummer books didn’t sell. So, his mammoth book ends with a happy visit to the year 3001. Population was well below its peak of 11 billion. The U.S. grain belt was a desert. African survivors were healthy vegetarians with solar panels and pedal-powered transport. The rainforest was long gone, replaced with endless fields of GMO crops. Wildlife and livestock had been eliminated by starving hordes. Happily, the human species survived — hooray! Compulsory happy endings meant that vital knowledge was deliberately withheld from an entire generation, who are now teachers, reporters, and leaders. Even today, a “don’t frighten the children” strategy remains common among educators, and young minds are still being infected with a carcinogenic worldview. Bummer! Ward, Peter D., The Call of Distant Mammoths, Copernicus, New York, 1997. Are humans too smart to become extinct? There is no evidence supporting such a fairy tale. Yet, most are promoting this delusion, another stab at species immortality, making it all the more likely we will go extinct in relatively short order. Party on! No one is responsible for whatever happens. Ward's book sounds interesting. It's a shame that Martin's amazing life work get's reduced down to the one or two ideas like the blitzkreig. He was an interesting character, researcher and thinker. I loved his book Twilight of the Mammoths and others. One of the things I took from that book was that climate change by Martin's take improved habitat conditions for many or most of the megafauna like the proboscids. 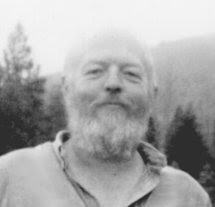 Here in Eugene there is a strong bolete impact hypothesis group led by Jon Erlandson, the head of the cultural and natural history museum, and one of my favorite anthropology profs at the UO 20 years back. One of his mentors at Santa Barbara is the leading geologist proponent of that hypothesis, which eclipsed the overkill hypothesis for a while, but now seems to be declining. I wouldn't be surprised if hunting, climate, and the younger dryas event (whether bolete caused or by ice melt ocean currents) all played parts in many of the megafauna species extinctions. But we have a few pygmy mammoth species that survived long after in Siberian islands and possible the channel islands. And many species seemed to live several thousand years after the younger dryas. And now we know that there were people living with proboscids and other megafauna for 5k or more years before they went extinct, so it's a challenging question we'll never fully know the answer too, since it's not knowable. It's clear enough to me that humans had a strong role in megafauna extinction. I personally feel a responsibility to try and restore some of limbs of the tree of life that we lopped off, and some branches like proboscids are worth considering restoring. The megafauna restoration movement has been experimenting with restoring the Indian elephant, which is closest to extinct N American probiscids to Texas and other areas. Cheetah, lion, camel, and horse are easier possibilities. The horse is already here and surviving on its own, all we'd have to do is let go of a little bit of the dogmatic parts of the religion of nativism (restoring ecosystems to 1850s) and stop rounding up wild horses and killing them. Giant sloths would be a lot harder. If we grant a responsibility to restore megafauna, it brings up fun dilemmas, such as what science would be ok to use, if we could clone from amber dna from permafrost, should we do it? Gene splicing for restoration? Hi Thom! Yeah, I think that Ward is sniffing some glue when he imagines the human species surviving for eternity. Life on Earth is an ongoing drama, with actors moving onto the stage as others move off. The picture looks very different when viewed from a 500 million year perspective. We’re here today. Enjoy! Are humans too smart? We’re very clever, but we’re way over our heads. We are never capable of foreseeing the unintended consequences of our techno-bumbling. A couple years ago, Craig Dilworth spent four days camping in my living room. His meme is the Vicious Circle Principle. He wrote Too Smart For Our Own Good — The Ecological Predicament of Humankind. Hi Erik! Greetings from Eugene! I agree that hunting certainly played a significant role in the extinctions. Martin took that notion to the extreme, but his hypothesis was based on minimal compelling evidence — with regard to North America. Paleontology seems to be about 98% theory and 2% evidence. We have found a few hundred pieces to a billion piece puzzle. This is about the Pleistocene extinctions? It would be nice to restore the missing megafauna relatives. I don’t think that there would be much support for reintroducing powerful carnivores… or elephants. “They trampled my garden!! !” We have been educated to be self-centered ecological pinheads. Ward gave me a few puzzle pieces I was missing, but he didn’t have a lot to say about most other megafauna extinctions. Interesting. They found tundra, and left it with boreal forest. You're right about paleontology, but what a fun science. The fossil record is amazing and beautiful, and leads to deeper religious feeling and truth than any religion in my book, if religion is thought of as reverence, or connection to the primary. It shows our deep connection with everything. Yes, the bolete hypothesis is thought by many to be the cause of pleistocene extinctions. See wiki: https://en.wikipedia.org/wiki/Younger_Dryas_impact_hypothesis. There's lot's of support for restoring the wolf and grizzly and they are recovering in many places, so why not the cheetah in the parts of the pronghorn range where there would be least fighting about it? They are why the pronghorn are so fast; they belong here. For the 400 generations, I was referring to the Willamette Valley for the folks of Penutian/Kalapuyan derivation, which we think had a continuous culture here for 9k years. They didn't find tundra and leave boreal forest. They found oak savanna and prairie and left oak savanna and prairie. We think the prairie grasslands developed with minimal or no human impact sometime from 7-10k ago during the peak of the Holocene warming, when it was much warmer than now. I like rock hunting too. I spent nine years in Upper Michigan’s copper country. Paleontology sounds challenging — lots of cat fights and hair pulling. That would get tiring for non-egomaniacs. But yes, the perception of deep time puts reality in a very different perspective than a 20th century perspective. Ah! Yes, I remember reading about the bolete hypothesis. So, do you have an opinion on why bison, pronghorns, elk, and moose made it, and horses and other megafauna did not? OK! No elephants. What about horse predators? I reviewed George Monbiot’s book, Feral, about rewilding in Europe. The library is about to close. The Eugene library has Ward’s mammoth book.